When I heard there was going to be a new Turtles game, I couldn’t have been happier. Seeing what Platinum did with Transformers gave me great hope in a game featuring the heroes in a half shell. I bloody love the turtles, even now I’m a 32-year old man with kids of my own, with my first ever video game being TMNT on the NES (the one with that hard as hell underwater level). The Ninjas have had a bumpy ride in their video game iterations, with very few actually being any good. Unfortunately, Mutants in Manhattan does very little to change that perception, providing a lacklustre adventure with some poor co-op choices and repetitive combat. Shredder and Krang are planning an invasion on New York City and it’s up to the turtles to go and stop them. 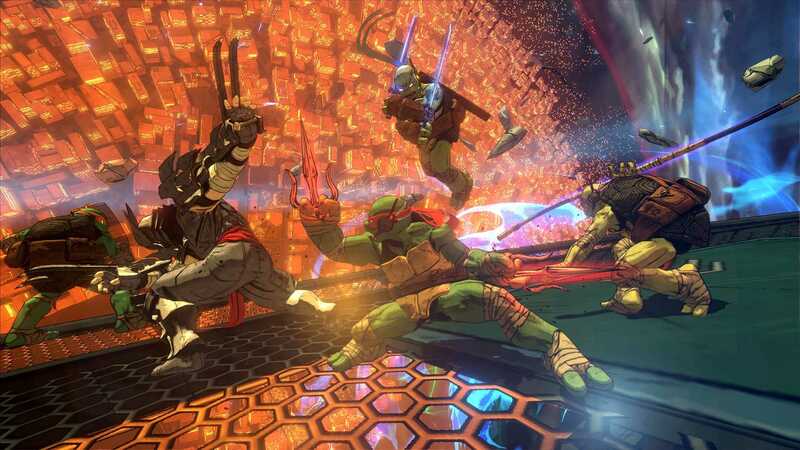 Nothing new there really, and you’ll pass through each stage at the speed of light until you meet up with some of the turtle’s most famous foes (favourites like Beebop, Rocksteady, and Karai all make an appearance). If you’ve ever played any of the One Piece or Samurai Warriors games, the pace may be familiar to you, but for many it will be chaos over control. Members of the foot clan will appear or mousers will emerge and you’ll have trouble spotting them straight away; everything happens so fast and when you finally spot them, there’s a good chance one of your brothers has already taken them out. You run around a relatively small level area with certain challenges popping up that you’ll need to complete in order to reach the end of stage boss, such as protecting a pizza van, disarming a bomb or fighting off waves of foot soldiers. They’re quite varied so it does offer a challenge, but the frustrating camera angles take a great deal of fun out of both the challenges and the combat. Combat does feel different between the characters, with Raphael being stronger than the others and Michelangelo being a lot faster, but after 3 or 4 stages the fighting feels repetitive and uninspiring. You have a normal attack and a strong attack, with upgradable Ninjutsu attacks causing most of the damage. 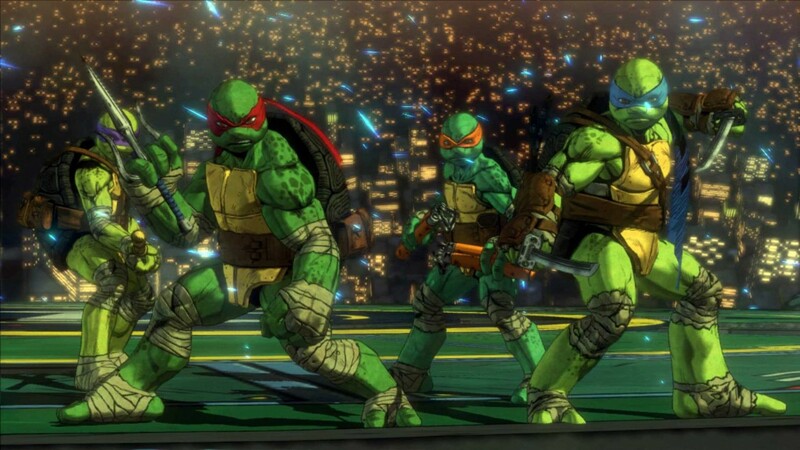 Each of the turtles has 4 of these attacks and depending on the kind of character they are, these moves will focus on their heightened attributes. Upgrading and interchanging these attacks in the loadout screen will help to mix things up a little, but generally the combat doesn’t feel that different. There are some good features when it comes to manoeuvrability and defence. You can climb walls, glide through the air and travel along railings and phone lines, helping you to get to where you want to go a lot easier than simply running. Parrying and dodging plays a big role as well, and this will help a great deal when fighting hulking brutes like Slash. The art style make up for some of the game’s frustrations. 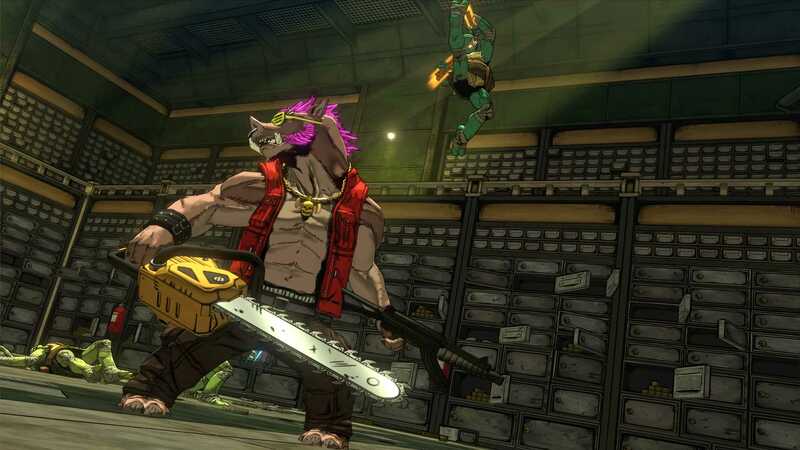 The cel-shaded rendering of the environments and characters give the visuals a sharp and colourful appeal, with the overall feel sharing a little in common with previous iterations of the TMNT. The recent Nickelodeon cartoon is an obvious comparison, but the tone of the story and the art style is reminiscent of the comics. The voice acting is probably where Mutants in Manhattan shines the most thanks to VO heavyweights like Nolan North (Nathan Drake, Uncharted) and Gavin Hammon’s (Kenny, The Walking Dead) involvement and the brotherly bond is portrayed really well. It would instantly be a better game if local co-op was a feature. You can go online and play with others, but there’s no real inclination to do so. Teaming up with your friends on your sofa is so much more appealing than over an internet connection and the absence doesn’t seem to make much sense. The turtles are all about camaraderie and friendship and not being able to play the game over a few pizzas just doesn’t seem right. It’s such a shame Mutants in Manhattan doesn’t hit the mark. It could’ve been such a better game if they’d feature more diverse levels, local co-op, and a much longer experience. I know Transformers Devastation wasn’t the longest of games either, but depending on the difficulty you can finish the game’s 9 levels in less than 5 hours which is a massive let down. Needless to say, this won’t be the turtles game you’ll want to be shouting from the sewers about.